Paul, attached is an mp3 copy of The Venetian Blind Man.. or rather the partial copy of it, it's missing about ten minutes in the middle. I discussed it here a few years ago, it's from a transcription disk, the wav copy of it I received was presented in three sections: 1st part, then the ending, and then a very poor recording from the middle of the episode - it's in that order on a single file, you can take it and put it back in the proper order and then maybe someone can recreate the 10 minutes which are missing. Several years ago I already put it in order and tried to clean it up a little, but now can't find that copy, I think it's on another computer in storage.So I'm just going to send you an MP3 copy of the wav directly from the transcription disc as I originally received.it.. I'm not actually supposed to distribute it, but what the hell, who's going to come after me? I don't see the attachment posted.. did it go through directly to you? Maybe I messed up so will try to attach it again... it's only 19mb. I just realized I posted in the wrong CATAGORY.. When it said "Originals" I thought it meant original as in.. the original copies! 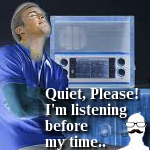 Back in July of 2014 I managed to turn up one of the long lost missing episodes of the Quiet Please radio program from digging through the Indiana University library, got an audio copy of it for $27, it had previously belonged to some guy (long dead) who had numerous random recordings on disc. I convinced the librarian to also snap a couple photo's of his disc which the audio had came from.. It's not an original disc, (www.hobbybroadcaster.net/a...te-please-program-disc.png )but the audio is definitely genuine. Not a particularly good episode I didn't think, but it was very cool to obtain a copy which has always been considered lost. It's not complete however.
" It was a part of Melville Herskovits' s Laboratory of Ethnomusicology at Northwestern University, which contained hundreds of ethnographic recordings on cylinders and discs, and several interesting recordings that seemed to have been recorded just for fun. The latter group had not been inventoried or documented, but we processed them just the same. (Lucky for you!) I'm sorry to say that I haven't found any other Quiet Please recordings in the Northwestern group. I really wish it were otherwise." By the way, I was the first (and maybe still the only one) who ever made a request for more info about it as the details were not at all clear as to what exactly it was, it had been classified as "talking word with music" and.. I can't recall what else exactly but I do know it was very vague description, but the year was right.. It was also the first time the audio was actually sampled since it had been in their collection there. It took a few months before I finally obtained it. I was excited about it. Thanks! Just listened to it. My production of the script only ran 26 minutes, so maybe it's only 7 minutes missing. I was just wondering if you might have any more audio recordings. This show is my favorite of all the Old Time Radio shows I've ever heard, and I am always hoping to find more. Thank you for the Venetian Blind Man!